We'd heard that Microsoft would have a new wearable device soon, and now we may have our first look at the goods. Microsoft already has a companion app on the Mac App Store, which shows what the new Microsoft Band will probably look like. 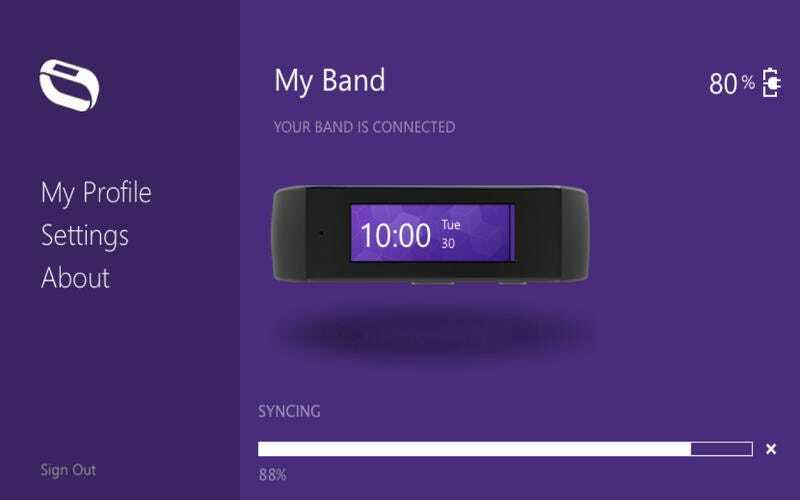 Officially released by Microsoft Corporation today, the Microsoft Band Sync app describes itself as a way to sync "your band" to the cloud — in case you'd want to do that with your Mac instead of your phone. Unfortunately, there are precious few details about the device that we can glean from the app store listing. It appears to show the time and date (duh) on a color screen (hmm) and has a pair of big physical buttons clearly embedded in one side. The band also has a tiny hole on the left, presumably for a microphone (hello Cortana). Also note that the picture could be a placeholder image of a "generic" smart band dreamed up by Microsoft artists specifically for the app submission process. It's always a possibility when dealing with early CG images like this. But as The Verge's Tom Warren notes, Microsoft has also just published other apps on Google Play and the Windows Phone app store that shed more light on the band. Dubbed "Microsoft Health," they all but confirm that the device will be called the Microsoft Band, and will boast a variety of features: 24-hour heart rate monitoring, calendar alerts and email previews, and Cortana to take notes and set reminders using voice commands. And, of course, track your steps and calories. Smartphone notification support appears to include email messages, calendar reminders, phone calls received, text messages, Twitter and Facebook notifications, weather, and stocks information. Microsoft's Band will also notify owners about the weather using location information from a phone. "There is a finite number of messages the Band will display for each notification," reads a Microsoft description. After a leak (or more likely an intentional push) of this caliber, we'll no doubt see the Microsoft officially reveal the Band soon.